for details and live updates. The one-day strike will be followed next week by a third 2-hour strike of UCU, two having already taken place in 2014, action which is due to escalate unless there is negotiation. Local action is taking place at higher education organisations University of Nottingham and Nottingham Trent University. Local action has included pickets and ‘teach-outs’ in the city centre. At University of Nottingham, Unison and Unite members are not out due to local agreements. Update: UCU members at Aberdeen, Bradford, East London, West of Scotland, Greenwich, Staffordshire, the Leeds College of Art, Manchester Met, Nottingham Trent, Robert Gordon and Queen Mary UL are all being called out on Monday 10th Feb for a full day strike because management has been docking a full days pay for a 2 hour strike. Also see the National Campaign Against Fees and Cuts for news of student-led actions and solidarity: http://anticuts.com. Read also: Why the universities strikes are about more than just a ‘measly’ pay offer. University & College Union Strike Action (31st Oct 2013). UCU said today (21 November 2013) it was disappointed that talks aimed at resolving a pay dispute in universities ended without a resolution last night. The union said to avoid strike action across UK universities on Tuesday 3 December the employers’ representatives, UCEA, had to improve the 1% pay offer that was rejected by staff and which prompted strike action. UCU said it hoped there could be further talks before the 3 December action, but that the employers needed to return with an improved offer. … employers had a combined surplus last year of more than £1.1bn, according to HESA, yet were prepared to offer a pay rise which covered barely one-third of the increased cost of living. our employers are sitting on billions of pounds of reserves, around £10bn (even after pension liabilities) according to HESA, yet say they cannot afford to help staff whose pay has fallen in real terms by 13% since 2009. These facts and the employers’ intransigence are why the National Union of Students (NUS) have called for further, urgent negotiations between both sides with the aim of agreeing ‘a fair and sustainable settlement for higher education staff’. UCU and our sister unions have agreed to this sensible suggestion, but the employers have not. Government U-Turn: Victory for the Action For ESOL campaign! The Skills Funding Agency has confirmed that full funding is available for ESOL and other adult courses formerly subject to the restrictive eligibility criteria that would have excluded up to 75% of adults on so called ‘inactive’ benefits. This represented a huge attack on adult education, and would have affected students from some of the poorest inner city communities. Action for ESOL was particularly concerned with the impact on non-native speakers of English who need English to support their children, find work, access education and play a full role in their communities. 250,000 adult places that were risk this year can be now be saved! This is an important victory for the Action for ESOL campaign. Nottingham ESOL (English for Speakers of Other Languages) students are handing over their massive petition against hikes in their course fees to Lilian Greenwood MP this Friday 27th May at 3pm. Please go down and show your support. The fee increases mean that 84% of those currently learning English (including many refugees and asylum seekers) will not be able to carry on with classes from September. TIME AND PLACE – 3pm at Lilian Greenwood’s Office, 12 Regent Street, Nottingham, NG1 5BQ. serve the Gedling community. It is imperative that the LA are made aware of the feelings of the community. Hopefully we can seek media attention for this event. The group would welcome any support and involvement, firstly, to promote the event and secondly, on the night itself. Background: http://savegedlingschool.wordpress.com/ (also do a search on Notts SOS site for previous articles). This week, on March 22nd and 24th, the University and College Union (UCU) took strike action in defence of the pay and pensions of academic and academic-related staff and against the employers’ attempts to bypass nationally agreed procedures for making redundancies. The majority vote for the strike is also a response to the wider political situation and most immediately the rise in student fees. Staff on strike in Nottingham were from Castle College, South Notts College, Nottingham Trent University and University of Nottingham. 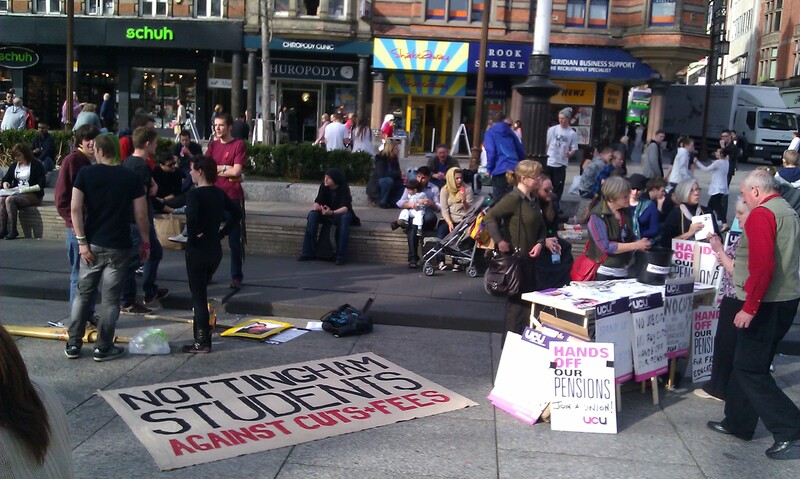 Students added to the numbers on picket lines and ran solidarity events all over Nottingham. The local strike leaflet was written by staff and students together. [Download student side of leaflet] [UCU staff side of leaflet]. Look at some photos here: http://nottingham.indymedia.org/articles/1073. UCU officers and campaigners put lots of effort into building for the strike, not least in co-ordinating between institutions. For some of us Notts SOS UCU members it was the first time we had been involved in organising a strike as opposed to just turning up for picket line duty. It’s a lot of work, but we learned lot from more experienced staff. I think we can be pleased with the results, because support for the strike was amazing. Hundreds of staff stayed away or picketed. Staff from other unions or no union beeped their horns in support at picket lines and asked for leaflets and information about the strike. Many university security staff were supportive and helpful also. Even though some public sector trade unionists crossed picket lines, others, notably City and County Council workers such as bus drivers, beeped their horns in support and passengers also waved at us. The UCU and students condemned the University of Nottingham’s assertion that the strike was undemocratic, pointing out that not only was it entirely legal, but percentage-wise the majority in favour of the strike was bigger than the vote for the Conservatives in the last election. The strike culminated in a rally in the Market Square attended by several hundred people. Speakers made it clear even though workers are not legally allowed to strike except over their own pay, terms and conditions, there is a mood to go beyond this just as there is elsewhere in the public sector. To do this university staff – UCU, Unison and others – need to work together more closely so that the government and employers fear our strength just as they fear the new radicalised student movement that mobilised in support of us this week. 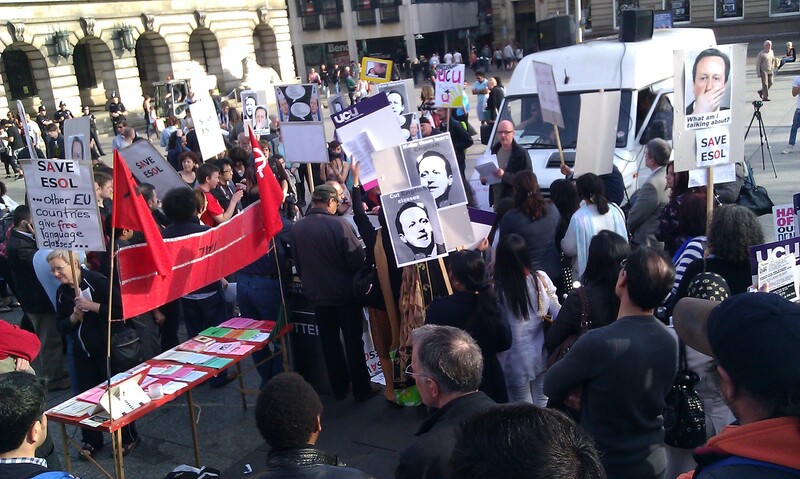 This was the message at the rally on Thursday March 24 in opposition to the cuts in funding ESOL classes. ESOL stands for English for Speakers of Other Languages and classes have traditionally been free for most students, who include people on JSA and ESE. But in Nottingham 76% of people on ESOL courses do not receive these benefits. They include refugees, asylum-seekers and other migrants who need English to integrate and contribute to British society. One of the messages of the rally was David Cameron’s hypocrisy in stating that refugees should integrate and at the same time removing one of the most important ways they can do this. About one hundred and fifty teachers, students and their supporters attended and several refugees spoke about how important free access to English classes is to them. Their confidence in speaking in public in a second language is a tribute to their teachers and shows that having good language skills is not just about the ability to communicate but the confidence to do it in the first place. As one of the speakers said, it is an attack on basic human rights. Removal of free ESOL classes is about more than saving money. It is about marginalising vulnerable people and we need to understand it as part of the state’s attack on refugees and asylum seekers, making it even harder for them to access help. Even though this rally took place hours after the UCU rally earlier in the day, dozens of higher and further education staff and students waited after their own event to attend the ESOL rally. As one UCU member said, “Education is vital for liberation”.